Dan Truman and Ron Saltmarsh are connected in a musical common destiny. Friends since their college time at Brigham Young University they gained degrees in Recording and Music Composition. After that education both went separate ways, just to find together again in the formation This Way That and their debut album Festival (2001). Their newest collaboration is called Saltaire. This year they released their sophomore album entitled Just Press Play. All songs were written and arranged by Dan Truman & Ron Saltmarsh. Ron Saltmarsh plays guitar, rhythm programming and keyboards, Dan Truman piano and electric piano. The album is also featuring Scott Wilson (trumpet), David Halliday (saxophone), Joel Stevenett (drums), Rob Honey (bass), Dave Wilbur (bass), Reggie McBride (bass), Danielle Aslett (percussion) and Mindy Gledhill (vocals). 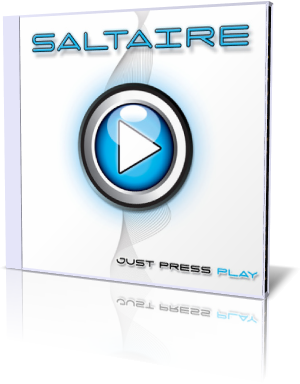 Just Press Play is Saltaire's suggestion and we should take this proposal seriously. Their joyful introduction presents Ron on guitar and Dan on piano in a superb uplifting performance. The slow tempo On The Verge brings trumpeter Scott Wilson in position. Scott is founder of the on-line Jazz Education Store and Assistant Professor in Jazz at the University of Florida. With Skyline Express Saltaire picks up a very popular motif. The fast movement of a train imitated in a propelling rhythm. Less programmatic more melodic their interpretation enjoys. As an avid lover of excellent keyboard sounds and intelligent arrangements I have a weakness for Barely Breathing. Kevida Kavada features David Halliday on sax. Overall an entertaining experience. Friends of the music of Jim Brickman or Scott Wilkie will like the romantic ballade The Silver Lining. Slow Dance on Kapalua will awake your lust to travel to Maui, once the place for beautiful smooth jazz concerts and still one of the most attractive places you can imagine. Song For The Willamette is a captivating tune with a great hooking potential. If you have ever been in Sousse, Tunisia watching the sunset, you might have felt the dreamy atmosphere of this location. Sunset in Sousse perfectly displays this venue in notes. When Truman and Saltmarsh show their jazzy attitude like on Wrapped Around Midnight, they reveal their elegant and sophisticated performance. With Just Press Play Saltaire has forged a glittering and glossy album full of appealing songs. High smooth jazz quality on the whole album.